Summary: Weirdly enough, I laughed the most for this series due to its over-the-top comedy. But it is very cliche and does not have a satisfying plot/conclusion. Milky Holmes is a joint project between the animation studio and Bushiroad (makers of anime-related trading card games) as a vehicle to sell their products, similar to Good Smile Company's Black Rock Shooter. For BRS, they went with a famous director and promising new studio, while for Milky Holmes they went for an average studio and.... average animation staff. 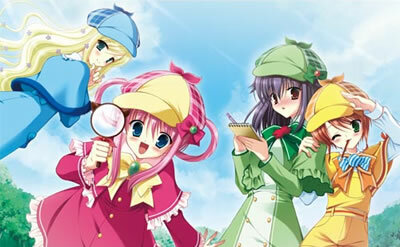 On the surface, Milky Holmes seems like a typical comedy for kids. The style of comedy would soon have you thinking that it is a parody. Eventually, the weirdness will make you realise this show does not target kids, it targets OTAKU. Makes sense, since their core TCG customers are teenage/adult otakus and not kids. But there is something about this show that is not quite right. Some bloggers rave about how unique and different the comedy is. I just think that the weird parts are repeated too much and the truly comical parts are just inconsistent. The show doesn't seem to have a direction and the type of humour changes quite often to the point where I'm sure everyone would find something to dislike. Compare this to PSG and you'll get what I mean. The comedy in PSG is much more consistent. If you love those kind of jokes, you will love the series. If not, just stay far away from it because it will not change. While there are some sequences that are nicely animated, J.C. Staff proves again that they are the king of mediocre. I think I praised them for their consistency in another review sometime ago, but now I just feel that they do not have the talent to properly animate some important scenes. HOWEVER, do note that right now they are also animating Index season 2, and, judging from what I have seen briefly, it has awesome action scenes. Perhaps their good animators are all working on that? But that doesn't excuse them from neglecting their other shows. Bakuman (still ongoing) seems to suffer from the same poor animation quality. Both Bakuman and Milky Holmes don't seem to have very good directors working on it either. At the very least, this series is funny enough for you to laugh with and laugh at. It isn't anything special, especially not for me. 2ch has voted this at Best Anime of 2010, so perhaps I'm missing the point of this show?